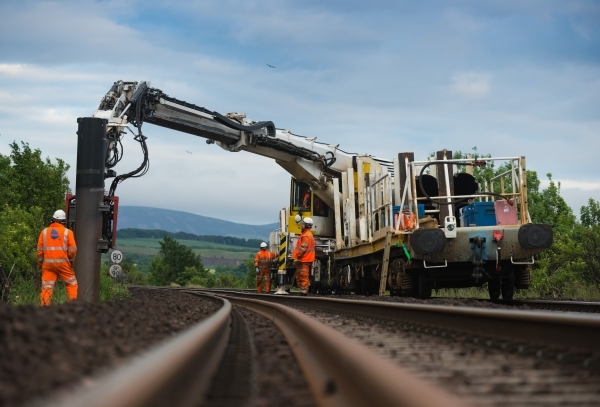 The EPT sets a new standard for railway infrastructure piling operations by delivering true high output performance. The system is formed from a KRC 250 rail crane, SB Rail’s unique robotic crane head and a side insertion pile driver. EPT offers greater power and reach over RRVs and is self-contained, requiring no site deliveries. Safer operations are achieved through a production line approach, with fewer individual machines and movements required on site. Where greater driving depths are required, or in the event of more challenging ground conditions, the cranes are configured to use a secondary heavy-duty vibrating pile hammer to ensure minimal refusals. Manufacturer: Kirow crane. SB Rail attachments, pile wagons and systems integration. Movax piling head.